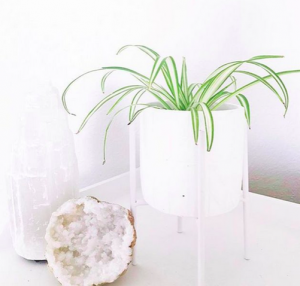 Now that the weather is getting colder, we’re battening down the hatches and spending more time inside, Hunker, a Santa Monica-based home design brand, has some fresh ideas on how to use houseplants to purify your indoor air and bring some nature into your home. Have a brown thumb? Never fear-many of these plants are surprisingly hardy and low maintenance. Ready to go green? DTLA is blooming with nurseries and purveyors offering an array of plants, accessories, gardening products, and services. The peace lily (Spathiphyllum wallisii) is one of the few houseplants to bloom indoors. With pure white flowers that look like seashells and shiny, lush oval leaves, this lovely specimen brings a summer feeling into your home all year long. 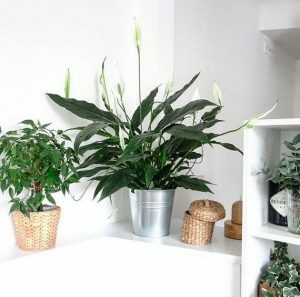 One of the best plants for air freshening, all your peace lily asks for is low light and a drink when its leaves droop. 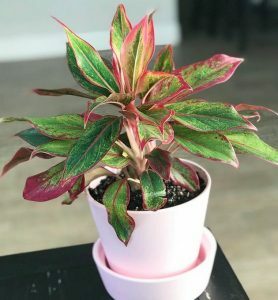 The Chinese evergreen (Aglaonema commutatum) is a handsome houseplant with large, variegated leaves (up to two feet long) on short stems. It will clean your air and add a pop of color to a counter or corner. An easy-care houseguest, this plant will grow happily in low-light areas. 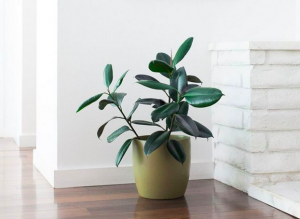 A rubber plant (Ficus elastica) is your go-to budget-friendly air-filtration system! The thick, leathery leaves are powerful air purifiers and the plant is almost foolproof, thriving in dry soil and dim lighting. It’s also a great option if you’re looking to cultivate a large plant, as it can grow quite tall, even touching the ceiling. 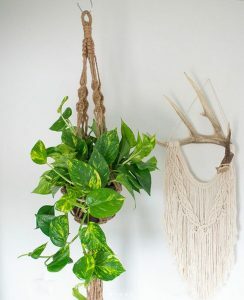 If you’re looking for a good air cleaner, Golden pothos (Epipremnum spp) should be on your list. With its distinctive yellow-speckled, heart-shaped trailing leaves, this plant adds a decorative touch when displayed in a hanging container. Tough and robust, the foliage stays green even if the plant gets very little light. Anyone allergic to common dust needs to get some spider plants pronto! Spider plants (Chlorophytum comosum) are those “helicopter” plants with long, trailing skirts of leaves, growing baby plants at the tip of long, pale, drooping stems. Spider plants are easy to grow, requiring only indirect light and occasional watering. This attractive, fast-growing plant can purify your indoor air in just a few days, and also absorbs mold and allergens. City Home & Garden is the largest wholesale/retail indoor plants store in the DTLA Flower District. This full service nursery provides quality indoor plants, orchids, and pottery for wholesale, commercial and retail customers. They also make flower and plant arrangements for commercial and retail customers. You can select pottery from the shop or bring your own for planting or custom arrangement service. Local delivery and set up are available. Founder Ha Huu opened the doors of Rainbow 22 years ago with the mission to share her knowledge and experience of Asia’s heritage. The establishment specializes in a variety of indoor and outdoor plants, from succulents to fruit trees. They also carry a large selection of traditional to contemporary home decor. A DTLA icon since 1921, located in the heart of the Los Angeles Flower District, The Original Los Angeles Flower Market is an expansive indoor floral marketplace open to both the trade and the general public. Virtually every in-season, commercially sold variety of cut flower is available from growers all over the globe. The selection and quality are remarkable, and so are the prices. Established nearly 100 years ago, the Los Angeles Flower District has grown to become the single largest and most successful wholesale floral district in the entire United States. While you’re in the neighborhood, be sure to check out The Southern California Flower Market, and the approximately 200 adjacent wholesale and retail floral businesses, shops, malls and marts within the surrounding six-block area.